For other uses, see Snakeskin (disambiguation). Snakeskin may either refer to the skin of a live snake, the shed skin of a snake after molting, or to a type of leather that is made from the hide of a dead snake. 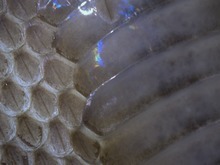 The large scutes on the right side cover the ventral, or belly side of the snake. The smaller scales cover the rest of the snake. Note how the scales overlap. Snakes can be ornately patterned. They can be striped, banded, solid, green, blue, yellow, red, black, orange, brown, spotted, or have a unique pattern all their own. These color schemes can serve many functions, including camouflage, heat absorption or reflection, or may play other, less understood roles. Melanin cells in the skin often overlap and form complex patterns and sheets that are highly recognizable. Sometimes the soft integument of a snake is colored differently than their hard scales. This is often utilized as a method of predator determent. Coloration of snakes is largely due to pigment cells and their distribution. Some scales have lightly colored centers, which arise from regions with a reduced cuticle. A thinner cuticle indicates that some sensory organ is present. Scales in general are numerous and coat the epidermis, and they come in all shapes and colors. They are helpful in identification of snake species. Chromatophores in the dermis yield coloration when light shines through the corneal layer of the epidermis. There are many kinds of chromatophores. Melanophores yield brown pigmentation, and when paired with guanophores, yield grey. When paired with guanophores and lipophores, yellow results, and when guanophores and allophores are added to melanophores, red pigment results. Carotenoids also help produce orange and red colors. Dark snakes (dark brown or black in color) appear as such due to melanocytes that are active in the epidermis. When melanin is absent, albino individuals result. Snakes do not possess blue or green pigments. These arise from guanophores, which are also called iridocytes. These reside in the dermis. Iridocytes are also responsible for the iridescent appearance of many dark-colored snakes. Males and females may show varied coloration, as might hatchlings and adults of the same species. Exposed integument of the garter snake after the overlying scales have been removed. 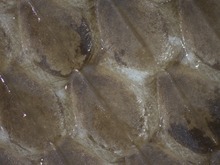 Reptiles, including snakes, possess extensive keratinization of the epidermis in the form of epidermal scales. A snake's epidermis is composed of four layers. The outer layer of a snake's skin is shed periodically, and is therefore a temporary layer, and is highly keratinized. Beneath the outer layer is the corneal layer (stratum corneum), which is thickened and flexible. Under the corneal layer is intermediary zone (stratum granulosum) and the basal layer (stratum basale), respectively. The dermis of a snake resides beneath the epidermis. The dermis of snakes is generally fibrous in nature, and not very prominent.The dermis houses pigment cells, nerves, and collagen fibers. Nerve fibers extend into the snake epidermis and anchor near scales, generally at the rostral, or head, end of the snake. Specifically, nerves anchor to sensory spines and pits, which are touch and thermal detection organs, respectively. The hypodermis is below the dermis. This layer mainly stores fat. Molting is common, and results in the entire outer layer of epidermis being lost. For more about molting, see the Snake page. For more about the epidermal scales of the snake, see the Snake scale page. The skin of a snake is a physically protective layer. It helps prevent injury, prevents drying out, and helps snakes to minimize friction. Because snakes lack limbs, their bodies are in contact with some surface at all times, which produces a huge amount of friction. As a result, they have to both minimize friction in order to move forward, and generate their own friction in order to generate enough propulsion to move. Scale and skin orientation helps to accomplish this, and it has been demonstrated that nanostructures on their scales may play a role in this process. Some snakes polish their scales. They secrete an oily substance from their nasal passage, and then rub the secretion all over the scales. This is done at varying intervals depending on the species of snake, sometimes frequently, other times only after shedding or molting. It is thought that scale polishing is used as a method of waterproofing, and it may also play a role in chemical messaging or friction reduction. Exposed integument from the underside of a scute of a garter snake. Skin permeability may change seasonally in snakes to help with the problem of drying out. It is known that desert snakes have generally impermeable skins, and that aquatic snakes have a more permeable skin that can sometimes trap water to prevent drying out. Some snakes may change their environment throughout the year, and may subsequently change their skin's permeability as a result. For instance, aquatic snakes may latch on to more water if they are in an environment that is drying out by attracting a layer of water under their scales. Not many glands are present in snake skin. Most snake glands are holocrine glands, meaning that the gland's cells are secreted along with the substance the gland makes. These holocrine glands in snakes do not have their own blood supply, and thus lie closely with vascularized connective tissue. Snakes also possess glands that aid in attracting mates, and some marine snake species possess a salt gland that helps remove excess salt that they have consumed. Most glands in reptiles are poorly understood due to their scarcity. The skin that lies beneath snake's scales is also responsible for snakes' flexibility. The regions between snake scales is made of soft integument that allows for movement. Snakes belong to a group of reptiles called the Lepidosauria, which are reptiles with overlapping scales. They further are grouped down into the Squamata, which includes all snakes and lizards, and all but two species of Lepidosauria that belong to the Rynchocephalia (the tuatara). The species belonging to both of these subgroups likewise share similar skin features with snakes, with unique adaptations and features, respectively. Close up of garter snake scales. Note the presence of soft integument, or skin, between the scales and how they overlap. The molting of the skin occurs regularly in snakes. This is when old skin is outgrown. In the case of snakes, it is called shedding or ecdysis. Snakes will rub against rough surfaces to shed their skin. A shed skin is much longer than the snake that shed it, as the skin covers the top and bottom of each scale. If the skin is shed intact, each scale is unwrapped on the top and bottom side of the scale which almost doubles the length of the shed skin. While a snake is in the process of shedding the skin over its eye, the eye may become milky. This impairs the vision of the snake and may result in aggressive behavior. Snakeskin is used to make clothing such as vests, belts, boots or shoes or fashion accessories such as handbags and wallets, and is used to cover the sound board of some string musical instruments, such as the banhu, sanxian or the sanshin. Snake leather is regarded as an exotic product alongside crocodile, lizard, ostrich, emu, camel, among others. With crocodile and lizard leathers, it belongs to the category of reptile leathers, with a scaly appearance. The Lamia: In this 1909 painting by Herbert James Draper, Lamia has human legs and a snakeskin around her waist. There is also a small snake on her right forearm. Queen Paola of Belgium wearing a hat made of imitation snakeskin. ^ a b Mattison, Christopher (1995). The Encyclopedia of Snakes. London: Blandford. ^ a b c Mattison, Christopher (2007). The New Encyclopedia of Snakes. Princeton: Princeton University Press. ^ a b c d e Bauchot, Roland (1994). Snakes: A Natural History. New York: Sterling Publishing Company. ^ a b c d e f Kardong, Kenneth V. (2015). Vertebrates: Comparative Anatomy, Function, Evolution (7th ed.). New York: McGraw Hill. ISBN 9780078023026. ^ a b c d Bauchot, Roland (1994). Snakes: A Natural History. New York: Sterling Publishing Company. ^ Parker, H.W. (1977). Snakes - A Natural History Talks. London: Cornell University Press. ^ Filippov, Alexander E.; Gorb, Stanislov N. (23 March 2016). "Modelling of the frictional behaviour of the snake skin covered by anisotropic surface nanostructures". Nature.com. Retrieved 10 March 2017. ^ a b Mattison, Christopher (2007). The New Encyclopedia of Snakes. Princeton: Princeton University Press. Wikimedia Commons has media related to Snake skins. This page was last edited on 19 February 2019, at 01:43 (UTC).